Today's two tracks are HEAVY! If you're not ready for some bass moving every part of your body, do not preview today's tunes I'm not normally big into dubstep but we all need some explosions sometimes to shake things up and keep it interesting. It's loud and obnoxious just like it needs to be. 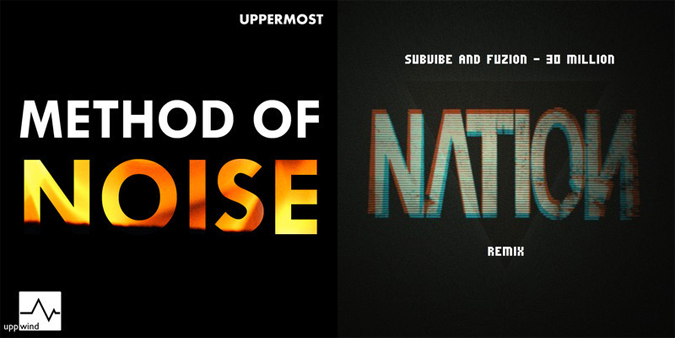 Uppermost is a bit gentler with a lot of electro influence while the NΛTION remix is just pure heavy dubstepping slaughter. So I ask, Yay or Nay on thy dubstep? It makes me feel like dancing! I'm with Bart. This wasn't heavy enough for me either. I wasn't really feeling it. First one was GREAT, seriously one of the best ive heard in this blog. Second one wasnt THAT good, but that's just me. BOOM that stuff's good when it's real loud, I dug it, I downloaded. Effyes. Second one got awesome half way in. awesome. I like the heavier tracks. Loving it,heavier stuff is great fun xD followed. Love the beginning of the first one, for obvious reasons ahhaha. Absolutely don't be afraid to drop some dub step when you feel like it. Part of what makes your blog great is the range. I think that this would make incredible workout music! Eh, I've never been the biggest fan of dubstep. The first track is killer! nation is pretty effing epic, good stuff. phew, wow that first track is probably my favorite of all the tracks u've posted recently no joke! its fire!!! Damn that remix is cool, how do you find all this? Awesome track! It has me dancing to the beat! Ha! I am actually editing the seven bad words out of a bunch of dubstep tracks for my radio show tonight! I think I may use that second track - it is pure ridiculousness! good stuff as usual, thanks for the tunes. Yay some times, nay when it's time to be a bit quiet. Love the blog! I think this is very good stuff, I love heavy tracks! Uppermost.... thank you for that!